Is Bahria Town about to compensate Sector F affectees with BTK? Bahria Town Lahore’s Sector F has been stuck in limbo for a while now. Despite being launched in 2012, there has been no real news about where people will be getting the plots they paid for. File owners have also protested to get possession of their property. Recently, a document was circulated within different stakeholder groups, seemingly pointing to a resolution. Given that there have been many rumours about the project in the past, we decided to look into the matter to see whether an end to the story was really in sight. As a developer, Bahria Town, has a strong tradition of coming up with societies that investors can be proud of owning. And in the past, it has made several offers to people who have paid for plots in Sector F, including adjusting their plots in Bahria Orchard, proposing allotting them property in other blocks within Bahria Town, and even offering to buy the files back at the market rate. However, investors have not seemed interested in these offers for valid reasons. File owners do not think that Bahria Orchard’s location can compare to what they were getting in Sector F. Since the people investing were largely genuine buyers, they opted not to sell their files back because they were looking to build homes, not invest for profit. Moreover, Bahria Town did try to buy back the property at current market rates, but because of the controversy surrounding Sector F, prices aren’t that great at the moment. Some file owners who cleared their dues were allotted alternate plots in several sectors, including Talha Block, last year, but many others are still waiting for a solution to their property woes. 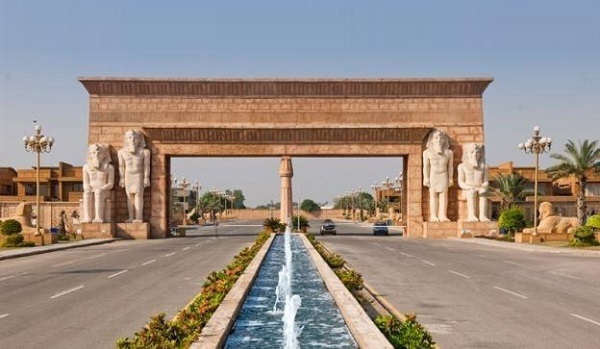 Several rounds of negotiations have been held between Bahria Town’s management and the victims until now, but the issue still stands. The document, pictured below, has not been issued on any letterhead. No one has signed it, although ‘SGM Customer Service’ has been written at the bottom, there’s no telling what SGM even stands for. From the looks of it, the letter does not seem to be authentic. 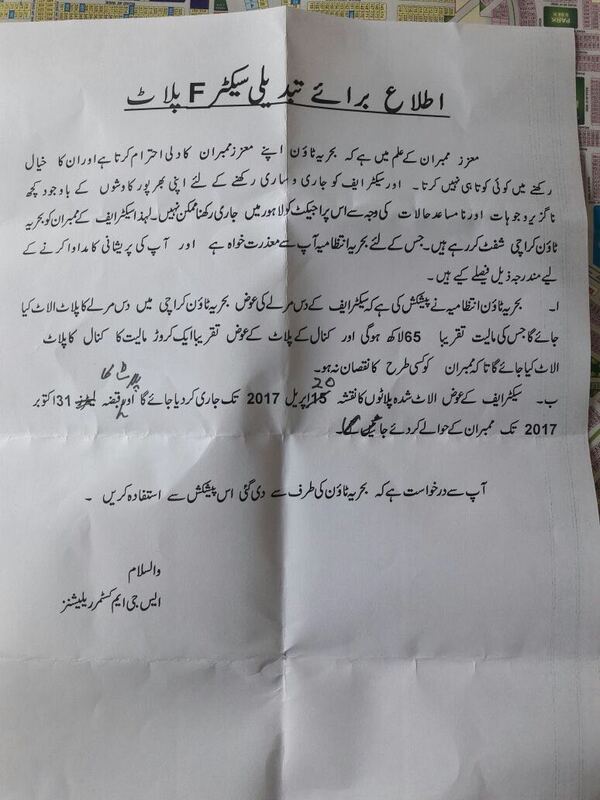 The contents of the letter are what most people find interesting. It reads that despite trying hard Bahria Town has been unable to carry on with Sector F in Lahore. It has therefore decided that file owners will be offered property in Bahria Town Karachi (BTK). The letter also apologises to those affected by the delays, and offers compensation. It furthermore claims that Bahria Town is offering 10-marla and 1-kanal alternate plots in BTK to the owners of Sector F 10-marla and 1-kanal plot files. As per the letter, the value of these 10-marla and 1-kanal alternate plots in BTK is PKR 6.5 million and PKR 10 million. The letter further reads that the map of these alternate plots will be released in April and the possession of plots will be offered to the owners on October 31. To confirm if this document has been issued by Bahria Town, I called them and learned exactly what I expected: Bahria hasn’t issued any such letter. Bahria Town could perhaps make such an offer to settle issues with Sector F affectees in the future. For now, however, this letter should be taken with a pinch of salt. There is no telling whether such a deal will ever be offered officially. While we wait for Bahria Town to give us an official verdict on the matter, tell me what you think; is this an offer that you would take up? Can a plot in Sector F be replaced with one in BTK? Let me know in the comments section below.